The University's Faculty Information System (Elements) provides a single point of organization, presentation, and reporting of scholarly and research activities. From publications and research data to grants, teaching and professional activities, Elements can be used to collect, understand, and showcase scholarly activities while making the data available for repurpose and reuse. Elements reduces the time and effort spent managing information about your research publications by automatically harvesting information from an extensive range of academic and scientific data sources. Research and professional activities, bibliographic data, and evidence of impact are combined in a single point of organization, presentation, and reporting. Integration with other campus systems provides the ability to promote and connect your scholarship and impact to others in the University community. Automate publication claiming: Confirm an author identifier and Elements will automatically claim all associated publications for it — now and in the future. Find experts and potential collaborators: Search the database using simple or advanced criteria for publication metadata, colleague research interests, and teaching or professional activities including and other areas of interest. Showcase academic achievements and evidence of impact: Collect and reuse information pertaining to scholarly output to create a rich online profile for viewing by peers at the institution and reuse in departments and schools. 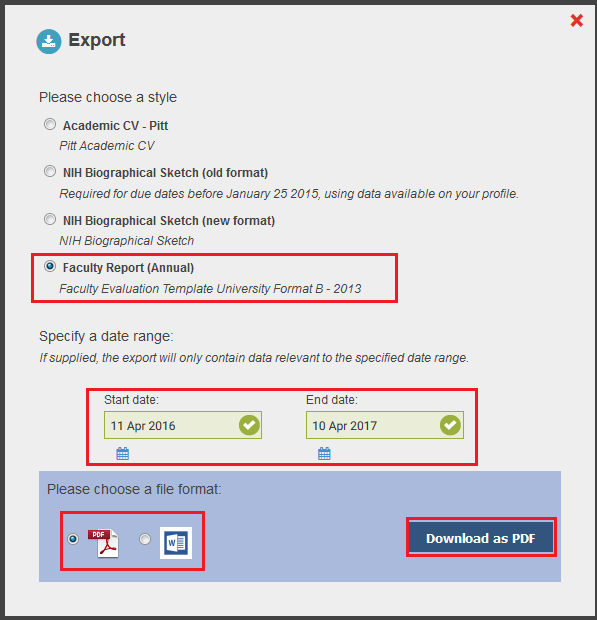 Generate CVs, Biosketches, and Faculty Reports: Export profile information using the pre-defined template formats for output, editing, and sharing with peers, administrators, chairs, and deans. Select Faculty Information System on the right-hand side of the page. 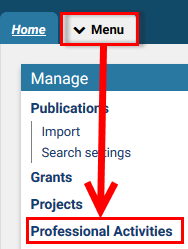 Follow the on-screen prompts in the My Actions section to take the recommended actions which may include adding author identifiers to help the system find your publications, claiming publications that are awaiting your approval, linking publications to peers and funding, and other suggested actions. Note: To view "how-to" videos about important Faculty Information System (Elements) topics, select Help from the upper right-hand side of the window. To learn more on how to use the Faculty Information System (Elements), you can view the Quick User Guide or refer to the videos below for detailed help using the enhanced service. A profile can be viewed by any other user in the system. It contains your photo, email address, an overview statement, your co-authors at your institution, experience, a list of publications, grants, and professional activities (grouped into recent, favorites, and all tabs). The Faculty Information System (Elements) lets users automate the claiming of both past and future publications using author identifiers. The Faculty Information System (Elements) contains a build feature that enables the export of profile information in a variety of formats. Users of the Faculty Information System (Elements) can manage information that is viewed by any other users in the system such as research interest and professional activities. Users of the Faculty Information System (Elements) can grant a delegate (or delegates) editing rights to an account under account settings. Delegates can manage someone else's account on his/her behalf. An impersonate another user feature can be used to claim or reject publications, and create new publications or professional activity records. Note: A delegate must have an account in the Faculty Information System (Elements). The Faculty Information System (Elements) allows you to enter details about grants you have received or worked on. Once entered, this data can be linked to other elements within the system such as users and publications, and can be displayed in your profile. Scopus is the world's largest abstract and citation database of peer-reviewed research literature and contains over 22,000 titles from more than 5,000 international publishers. This free author lookup tool can be used to search for any author; or use the Author Feedback Wizard to verify your Scopus Author Profile. 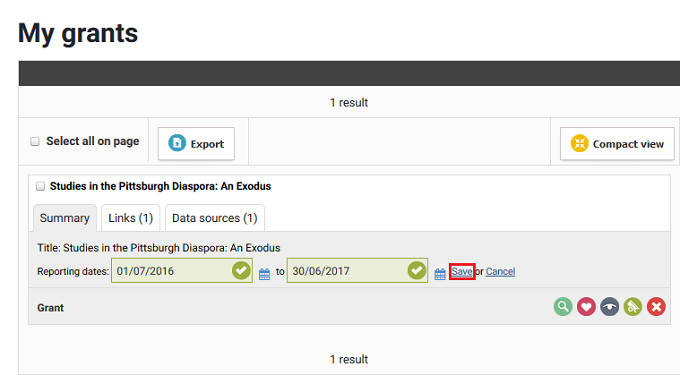 Once a unique ORCID is registered, Scopus can be used to import your records. An ORCID identifier is a unique and persistent identifier for researchers–an ID number that can help make your scholarship easier to find and attribute so that you get credit for all that you do. Newly identified publications that match your search terms are placed in the pending list of your records to await your approval. One of the actions in your My Actions list will take you to the pending publications so that you can claim or reject the publications. Many publications will be automatically identified or can be manually added. 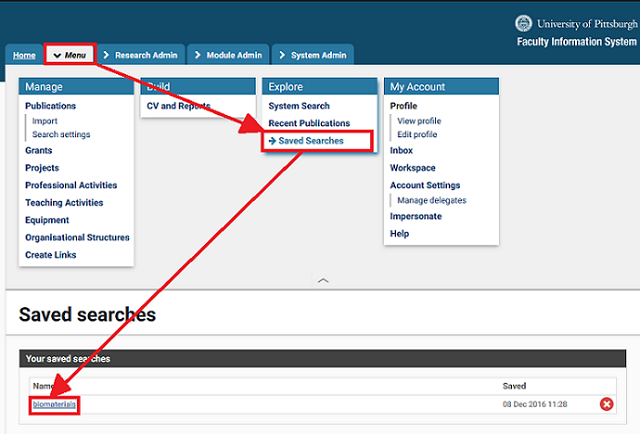 You can change publication search settings and manage duplicate records. The Faculty Information System (Elements) includes teaching activities such as mentoring and advising, research-based degree supervision, courses taught, and other categories. Note: For primary instructors of a course in the Student Information System (PeopleSoft), the system will continue to be updated automatically with courses taught three times a year. In the Faculty Information System (Elements), various information can be added such as Distinction (awards and honors), Committee Membership (professional societies), or Community Service-related activities. The use of favorites in the Faculty Information System (Elements) makes your items more visible. The Faculty Information System (Elements) lets you merge publication records which may be duplicates using your account's Workspace. The Pitt Faculty Information System (Elements) reduces the time and effort that faculty and researchers spend managing their publications. The system now features an innovative way for researchers to automate the claiming of both past and future publications. View your Pending Publications page in Elements; you may see a short set of questions that allow you to claim author identifiers and customize your settings. Confirm an author identifier and Elements will automatically claim all associated publications for it–now and in the future. Declare an author identifier as not yours and you do not have to manage it again. Review and manage author identifiers from a new Automatic Claiming page available at Menu > Manage > Publications > Automatic Claiming. Log in to the Faculty Information System (Elements) and go to Menu > Manage > Publications > Automatic claiming. In the Do these Identify you? section, select Yes. Confirm Auto claim publications is selected, then click OK. This adds the data source to your list of External Profiles and claims publications for you by placing them into your “Mine” folder. An ORCID identifier claimed (but not connected to your account) using this process, will harvest publication records containing the ORCID identifier and place them in the Faculty Information System (Elements). Go to Menu > Manage > Publications > Automatic claiming. Locate the Add email addresses section, then click Add email addresses. Enter your email address, confirm the selection of Auto claim publications, then click OK. This adds the email address to your profile and claims publications for you by placing them into your Mine folder. You can repeat these steps to add additional email addresses. Go to Menu > Manage > Publications > Search settings. Use Name variants to add a new name. Click the green plus sign (‘+’) to add another name. Check the Search by name box for each data source you wish to include. If you receive results for publications that are not yours, you can adjust how Elements searches. Results show up in your Pending Publications list for you to claim. Go to Menu > Manage > Publications > Search settings. Uncheck the Search by name box for each data source. Click Save. Publication results harvested from these results appear in your Pending folder, available at Menu > Manage > Publications > My Publications > Pending. To add them to your account, click Claim as mine. The Faculty Information System (Elements) lets you easily create an annual review report for your department chair or dean. In addition to information from your CV, the reports can contain information about goals and accomplishments. 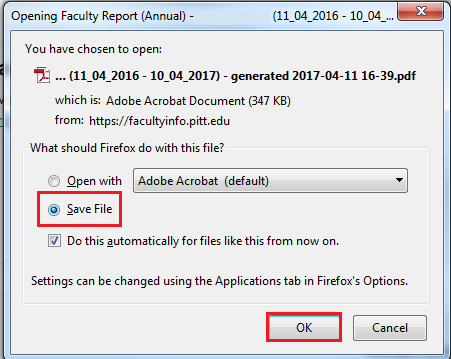 Select Faculty Report (Annual), specify both a Start date and an End date, then choose a file format (either PDF or Word). When you are done click the Download button. Note for date ranges: The start date and end date range for an annual report should encompass a year (365 days). The academic calendar year begins on July 1 and runs through June 30 of the following year (for example, July 1, 2017 through June 30, 2018). Follow the on-screen prompts to open or save your file. Note: If you save your file, take note of the location where it was saved. I have an entry from 2014 that was included as part of my faculty report generated for the 2016-2017 reporting period. Why was this entry included? When generating faculty reports for the 2016-2017 reporting period, make sure that entries in your profile (publications, grants, professional activities, and teaching activities) have a start and finish reporting date entered. If the reporting date field is not filled in for an entry, the report will include it by default. This is why an entry such as a journal article or grant from 2014 may show up in the report that you have entered a date range of 2016-2017. Locate a record that you wish to include or exclude from your report. Note: You can change reporting dates for publications, grants, professional activities, and teaching activities. 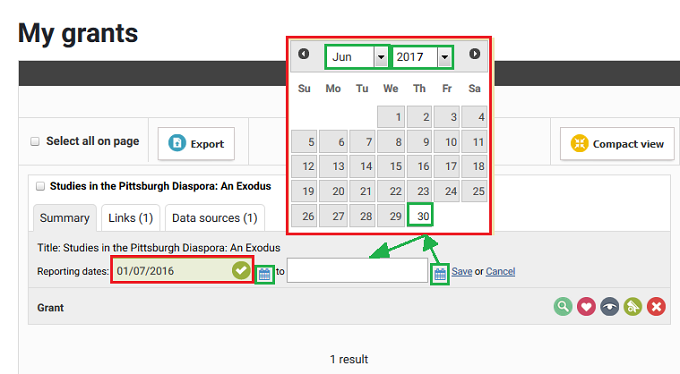 Locate Reporting dates: - to -, then click Edit to add a reporting date for a record. Click the field for start and end reporting dates. For each report date range field, select a month, year, and day from the calendar pop-up window. Note: All dates in Elements use DD/Month/YYYY European formatting (for example, 01 May 2017 instead of May 1, 2017). The record will be updated with those reporting dates. 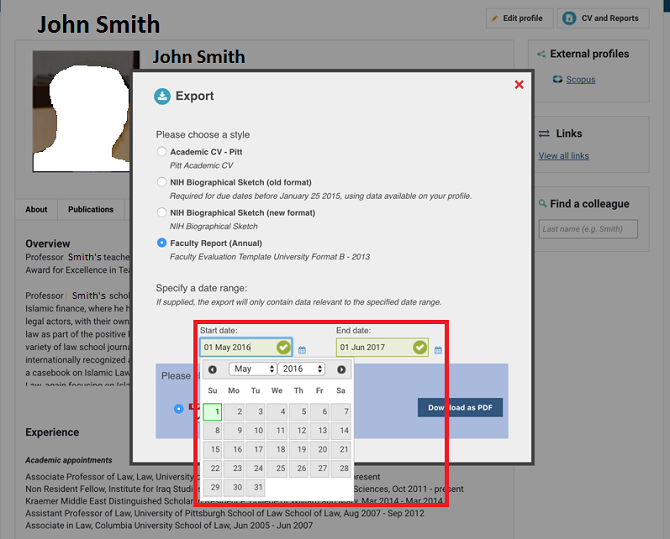 When you create your faculty report, use the Start date and End date calendars to search for and select dates. Only records with corresponding date ranges will appear in the annual report. Log in to the Faculty Information System (Elements). Select Menu, then select Professional Activities. Locate the Filters on the right-hand side. For Professional Activity type, select Research Interest. Your research interests are displayed. Select Add a new research interest from the drop-down menu on the right-hand side. Log in to the Faculty Information System. Select Menu, then select Professional Activities. Select Add a new research interest from the drop-down menu on the right-hand side. Click Menu, then select Professional Activities. Locate the Filters on the right-hand side. 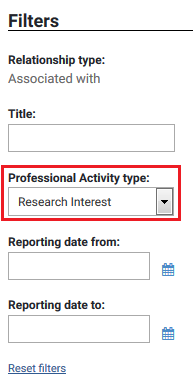 For Professional Activity type, select Research Interest. A list of your Professional Activities is displayed. Click the name of a Research Interest. Type in the change to your Research Interest, then click Save. A list of your Professional Activities will be displayed. Click the red ‘X’ located on the right-hand side of a Research Interest. Click OK to confirm your decision to delete the Research Interest. The Research Interest is removed. You can use the System Search feature to search for users by Research Interests. Log into the Faculty Information System (Elements). Select Menu, then select Professional Activities. Select Add a new research interest from drop-down menu on the right-hand side. Locate the Filters on the right-hand side. For Professional Activity type, select Research Interest. A list of your Professional Activities will be displayed. Click the name of a Research Interest. Locate the Filters on the right-hand side. For Professional Activity type, select Research Interest. A list of your Professional Activities will be displayed. Click the red ‘X’ located on the right-hand side of a research interest. Click OK to confirm your decision to delete the research interest. The research interest will be removed. Log in to the Faculty Information System (Elements), select Menu, then select System Search. For System Search: Enter your search term. Select Advanced. Additional search criteria are displayed that you can use in your search. To search for Research Interests, make sure that Professional Activities is the item checked for Search. At the top of the first page of search results, a message will be displayed indicating how many results were returned. You can select the Save this search link to save the search. You can review the Search results. They are displayed below your search criteria. Research interests will be indicated as Professional Activity: Research Interest. To save your search, click the save your search link, provide a description, then click OK. When you want to run a saved search, select Menu, Saved Searches, then click the saved search link. Can I add a Scopus ID to my Faculty Information System (Elements) profile? Yes. You can add your Scopus ID to your Faculty Information System (Elements) profile. If you need to find your Scopus ID, use this lookup tool>. Note: There is no registration process for a Scopus ID. You are automatically assigned a Scopus ID if you have a paper indexed in the Scopus database. Log in to the Faculty Information System (Elements). Locate the My Actions section, then click Add Scopus ID. Locate the Author identifier section, then enter your Scopus ID in the text box provided. A pop-up window displays publication results from Scopus. Check the results, then click Confirm. Note: If you see results that are not yours, click Confirm anyway. You can visit the Publications portion of your online profile to reject or remove claimed publications. Additional information about Publications is available in the Videos section of this webpage. When the Search setting updated dialog box appears, your Scopus ID has been saved. 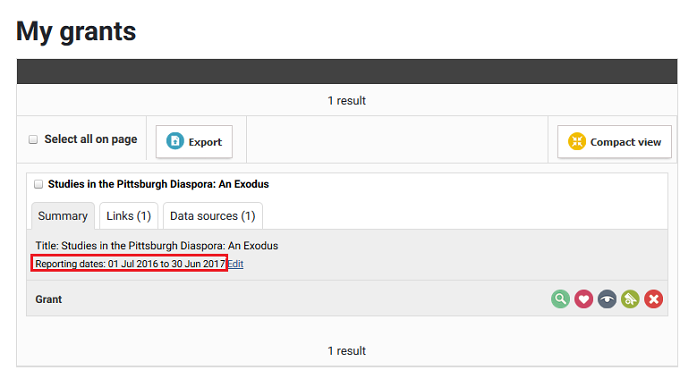 Note: Please allow one business day before existing publications are imported from Scopus into your Faculty Information System (Elements) profile. Can I add my ORCID identifier to my Faculty Information System (Elements) profile? Enter your ORCID identifier into the My Actions section of the homepage in the Faculty Information System (Elements). Once added, you will be taken to orcid.org for authenticating your ORCID identifier. How does ORCID help my Faculty Information System (Elements) profile? Once authenticated, the ORCID identifier will show in your profile and will be included in source-specific search terms for finding publications across the web. This will help the Faculty Information System (Elements) find your publications and connect them to you more easily, especially when you use your ORCID identifier for your publications and grants. ORCID is the Open Researcher and Contributor ID. What are some key benefits that ORCID provides? Making your scholarship easier to find and attribute so that you get credit for all that you do, including journal articles, presentations, videos, pre-prints, and other digital scholarly outputs. Connecting your research to your Faculty Information System (Elements) account throughout your career, no matter how your name appears in publication. Reducing the time you spend filling out forms when submitting research, applying for grants, creating an academic CV, or submitting an academic report. Making your work discoverable to others. How can I get a unique ORCID identifier? You can create a new ORCID identifier or connect an existing one (previously obtained from outside of the University) to the University Library System’s ORCiD@Pitt site. Where can I learn about ORCID identifiers? For additional information about ORCID, visit the University Library System resource page for ORCiD@Pitt. Where can I go for more assistance with ORCID? If you need help with creating your ORCID or have further questions about ORCID, please contact orcidcomm@mail.pitt.edu. Please contact the 24/7 Help Desk at 412-624-HELP (4357) if you have any questions regarding the Faculty Information System (Elements). The use of favorites in the Faculty Information System (Elements) lets you conduct peer searches to find other faculty with similar interests. Using Favorites also allows you to select information that you wish to add to public-facing profile pages via an API tool. You can add favorites to Publications, Grants, Professional Activities, and Teaching Activities. Select a record type to add from the Menu. Note: Publications, Grants, Professional Activities, and Teaching Activities can be marked as favorites. Enter the information for the new record, then click Save. Select Mark as Favorite from the Actions listed on the right-hand side. A small heart icon will appear next to the record name indicating it is a favorite. Select a record type from the Menu. Locate a record, then click the red heart-shaped icon for that record. A small red heart icon indicating it is a favorite will appear next to the record name. Note: Publications, Grants, Professional Activities including Research Interests, and Teaching Activities can be marked as favorites. Locate a record, then click the grey heart-shaped icon for that record. The small red heart icon will disappear from the record name. You can use the System Search feature to conduct colleague searches. Items that are selected as favorites will appear as the top results returned from your search. Log in to the Faculty Information System, select Menu, then select System Search. Additional search criteria are displayed that you can use in your search. For example, to search for classes, make sure that Teaching activities is the item checked for Search. At the top of the first page of search results, a message will be displayed indicating how many results were returned. Items that are selected as favorites will appear as the top results returned from your search. You can select the Save this search link to save the search. A tool (API) exists to allow your favorites to be added to the faculty profile, directory, or public profile page for your school or department. For example, favorite Research Interests (located as part of Professional Development) can appear as part of your departmental directory listing. A new Faculty Information System (Elements) Deposit feature lets you share your work via D-Scholarship@Pitt, the institutional, Open Access repository for the University of Pittsburgh. You can deposit articles, conference materials, presentations, datasets, multimedia content and more in D-Scholarship@Pitt, and share them. The University Library System of the University of Pittsburgh (ULS) hosts and maintains D-Scholarship@Pitt as part of its D-Scribe Digital Publishing Program. D-Scholarship@Pitt receives support from the Barco Law Library, Health Sciences Library System, University of Pittsburgh Press, the Office of the Provost, and Pitt Information Technology (Pitt IT). Provides stable long-term storage and ongoing maintenance of content contained within the repository. Increases discovery of your research by allowing indexing by Google and other major internet search engines, the Pennsylvania Digital Library, and PITTCat+ (the University Library System database). Lets you add full-text documents–allowing more people to discover your work, which may lead to an increase in citations. Make sure to finalize all changes to the metadata about your scholarly output in the Faculty Information System (Elements) before starting the deposit process. D-Scholarship is a repository archive for your documents rather than for scholarly output that requires frequent updates. Verify the scholarly output in the Faculty Information System (Elements) that you wish to deposit is complete. Go to Menu > Manage > Publications. Select Add a new publication, then select a publication from the drop-down menu (for example, Add a new journal article). Follow the on-screen prompts to add the publication. Note: If Elements does not locate the scholarly output using Search, select Go to next step, enter the metadata manually, click Save & Continue, provide and link Grant information, and claim the publication as yours. In the My publications section, select the title of the publication to view the full details. Select Edit record to make changes to the record prior to depositing. Enter your changes, then click Save. To deposit electronic files (for example, full text documents) associated with the publication record, use the Deposit button in the “Full text” section of the page. Log in to the Faculty Information System (Elements) and go to Menu > Manage > Publications. Locate an item that you wish to add to D-Scholarship. Click Deposit. Note: If you need to add scholarly output to the Faculty Information System (Elements), instructions are available. Note: Check the Deposit Advice and SHERPA/RoMEO> advice about which versions of the file you are able to deposit. Click + Upload another file. Repeat this step to upload additional files. When you are finished, go to the next step. OPTIONAL: Select a timeframe from the drop-down menu for Embargo period. For the specified time, the public can only view metadata about your file, but will not be able to download it. University of Pittsburgh users who log in to D-Scholarship can download your file. Note: In general, using an embargo improves discoverability and lets you share your work immediately. However, a publisher may specify an embargo requirement to allow archiving by the author after a selected period of time. OPTIONAL: Add a comment to identify the uploaded file(s). OPTIONAL: If you have not already granted a publisher a license that controls how your work may be used, you may check the box next to I would like to specify how others may reuse this work. Some publishers state requirements for sharing archived versions of articles. Note 1: Use SHERPA/RoMEO> to easily search for journal and publisher information about licenses. Note 2: To apply a Creative Commons license to your scholarly output, provide additional information about how your scholarly output can be adapted/shared or used for commercial purposes. Check I agree to the University of Pittsburgh License terms. Use these steps to deposit your scholarly output from the Faculty Information System (Elements) and any open access (OA) source into D-Scholarship by using a URL. This will be helpful if your article or other item is already published in an Open Access outlet (e.g., an open access journal or website) and you wish to link directly to the available item. Locate a publication and you wish to add to D-Scholarship. Click Deposit. Select the Enter an OA location tab. For OA location, enter a URL. Click Save location, and follow the on-screen prompts to complete the deposit process. See D-Scholarship file sizes, formats, and repository policies>. For additional questions about depositing scholarly output into D-Scholarship, email the Office of Scholarly Communication and Publishing at d-Scholarship@mail.pitt.edu.